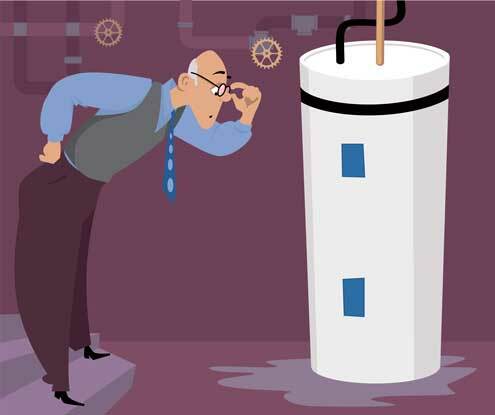 For many homeowners, hot water heater problems happen. Most don’t understand the parts in a water heater nor how they work or their location. They are aware they can replace the parts themselves, but they’re not confident of their ability to perform hot water heater repair. A common hot water heater problem is that it doesn’t heat water. Here are things to check before you jog over to the big box store for parts. First, check the breaker box to make sure the breaker hasn’t been tripped. If you have a fuse box, check that the fuse isn’t blown. If it is, please contact a professional. He will also make sure the fuse is the right size. Check the electrical outlet to make sure the heater is plugged in. It could be the heating element. If so, replace it. The thermostat could be at fault. If it is, replace it. If you feel uncomfortable working on it, then call a water heater repair specialist. Generally, this is a thermostat issue. The thermostat may need adjustment. You will find it behind an access plate on the side of the heater. Remove the layer of insulation. Now you can adjust the temperature of the thermostat. If this doesn’t do the trick, then the thermostat might need replacement. If so, contact a hot water heater repair professional. This, too, is a thermostat issue. The thermostat is set at the factory, but sometimes the temperature needs to be adjusted. Follow the steps above. If it still doesn’t work, then a professional will need to look at it. Few things are more annoying than taking an hour in the shower due to little water pressure. If you live in an older house, the chances are good that your pipes are ½ inch galvanized pipes. Homeowners will need to install ¾ inch piping that will allow more water through. Is Your Water Heater Taking Too Long? Hot water usually takes up to an hour to get hot again. Newer model water heaters are faster. Taking too long to reheat is a heating element issue. Sediment build-up on the heating element can also cause the water to take forever to reheat. Either replace the heating element or call for a water heater repair expert to help. Homeowners no longer need to be wary of repairing their hot water heater themselves. With the help of a diagram, the parts are simple to locate. Their replacement or adjustment is equally easy. We understand that waiting for the plumber is frustrating. We also understand it’s expensive. If you feel less than confident to repair your water heater, there’s nothing wrong with calling for help. They’ll be more than happy to help. They’ll also to instruct you where to look for the problem and how to replace the parts. Being a homeowner can be stressful, but it also has its perks! You can choose to make your home beautiful. One of our favorite ways is by starting a garden! Fix the water heater and get outside to enjoy our beautiful Southwest landscape!